Figure 1: Setup of the GRIPS 6 instrument at the German Remote Sensing Data Center in Oberpfaffenhofen (48.09°N / 11.28°E). The instrument is composed of an Andor Shamrock 163 non-imaging spectrograph, an Andor iDus DU490A-1.7 photodiode array (partly hidden behind the spectrograph and filterwheel), powered by a PS-25 power supply for deep cooling temperatures in combination with an Exos-2 water recirculator. The laptop shows a 15 second exposure of the OH nightglow between 1500 nm and 1600 nm obtained with the Andor Solis software. O3 + H → O2 + OH* (+ 3.32 eV). The excess energy of this exothermic reaction is mainly transferred into rotational and vibrational excitations of the OH-molecules (denoted by *). These OH*-molecules form a layer of about 8 km thickness at a peak altitude of about 87 km. 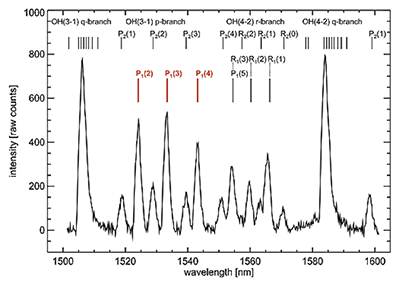 Returning to their ground state, the OH*-molecules emit infrared radiation in the spectral region between ca. 710 nm and 2500 nm. The brightness of this OH*-airglow varies between 10-6 to 10-4 Wm-2sr-1, making it the brightest phenomenon at the night sky (Leinert et al., 1998). Since the deactivation of the OH* takes place by a large number of successive rotational-vibrational transitions, the low energy transitions are supposed to be in local thermodynamic equilibrium with the surrounding atmosphere. It is therefore possible to derive the rotational temperature as an estimator of the kinetic temperature in this height by measuring the intensities of several rotational lines within the same vibrational branch. The measurements performed by the German Remote Sensing Data Center are a contribution to the global Network for the Detection of Mesopause Change (NDMC, http://wdc.dlr.de/nmdc), a program with the mission to promote international cooperation among research groups investigating the mesopause region (80-100 km) with the main goal of early identification of changing climate signals. Figure 2: The left panel shows the GRIPS 5 instrument deployed at the Environmental Research Station “Schneefernerhaus” (47.42°N / 10.98°E), located 2650 m above sea level at Germany’s highest mountain Zugspitze. 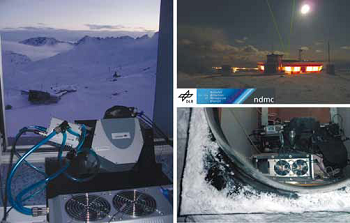 The right panels show the setup of the GRIPS 9 instrument under a dome on top of the roof of the Arctic Lidar Observatory for Middle Atmosphere Research (ALOMAR, 69.28°N / 16.01°E) in Norway during winter 2010/2011. One of the major topics of scientific interest in middle atmosphere research is the investigation of atmospheric dynamics on all time scales. This includes the study of climate trends over several decades as well as the characterization of different atmospheric waves. Depending on their nature these waves are categorized as so-called planetary, gravity and infrasonic waves. Their corresponding typical periods range from days to weeks for planetary waves, several minutes to many hours for atmospheric gravity waves and less than 5 minutes in case of infrasonic waves (e.g. Pilger and Bittner, 2009). While Meinel (1950) relied on exposure times of more than 40 hours for his discovery of the airglow phenomenon in the late 1940s, the application of an InGaAs-array detector (Andor iDus DU490A-1.7) in combination with a high aperture polychromator (Andor Shamrock 163) allows exposure times as low as 10 to 15 seconds. This temporal resolution is considerably higher than what was previously achieved with scanning spectrometers equipped with liquid nitrogen cooled ultra low noise Germanium photodiode. The thermoelectric cooling system of the iDus DU490A-1.7 constitutes an important advantage over liquid nitrogen cooled systems in terms of robustness and maintenance requirements. Therefore eight out of ten spectrometers currently operated by the German Remote Sensing Data Center are equipped with the iDus DU490A-1.7. The Exos-2 water recirculator efficiently helps stabilizing the temperature of the detector, even in rather warm environments of +30 °C or more. During routine observations the grating is placed at a fixed angle and the spectral region between 1500 nm and 1600 nm is shed on the 512 pixel InGaAs-array. While some of the GRIPS instruments are equipped with special entrance optics, others are simply mounted in upward direction to observe the night sky (see Figure. 1). Their field of view is thereby determined by the F-number of the Shamrock 163 (F/# = 3.7). Most important feature of the iDus DU490A-1.7 in its application to airglow observation is the fact, that the detectors dark currents, which are an order of magnitude larger than the recorded airglow signal, are very stable throughout the night, allowing accurate measurements of the emission lines intensities. Figure 3: Medium resolution OH*-airglow spectrum between 1500 nm and 1600 nm; the original OH-linewidth is less than 0.01 nm. The sppectrum was obtained with the iDus DU490A-1.7 detector mounted at the Shamrock 163 with the slit width set to 250 μm. The intensity is given in counts as retrieved from the iDus DU490A-1.7 operated in high sensitivity mode at a detector temperature of -60 °C and an exposure time of 15 seconds. The dark current of approximately 5000 counts per pixel has been removed. The three P1-lines of the OH(3-1) branch are used for the calculation of rotational temperatures. This particular spectrum yields a temperature of 213.6 K ±3.5 K. The uncertainty is estimated from the signal-to-noise ratio, which is rather high for this kind of measurement. For comparison note, that the photon flux is of the order of approximately 5000 photons s-1arcsec-2m-2μm-1 at the maxima of the two Q-branches (Leinert et al., 1998); the field of view of the instrument is approximately 15° full angle. The GRIPS 5 and GRIPS 6 instruments were the first to be equipped with the iDus DU490A-1.7 in October 2008 and January 2009 respectively. Since then they have been performing routine measurements almost every night. Until April 2011 the GRIPS 6 has been operated during more than 750 nights with the camera actually taking data between 7 hours (summer) and 15 hours (winter) each night. No significant change in responsivity of the system has been observed within these two years. The low maintenance requirements of the systems also facilitate the remote operation of spectrometers placed at distant sites, such as the Environmental Research Station “Schneefernerhaus” (47.42°N/10.98°E), located at Germany’s highest mountain Zugspitze and the Arctic Lidar Observatory for Middle Atmosphere Research (ALOMAR, 69.28°N/16.01°E) in Norway (see Figure 2). New observation sites throughout Europe and beyond are currently in preparation. 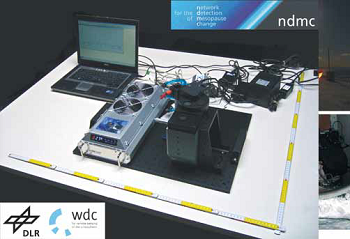 Data obtained with these instruments can be accessed in near real time via the World Data Center for Remote Sensing of the Atmosphere (WDC-RSAT, http://www.wdc.dlr.de/ndmc). Figure 3 shows a typical spectrum obtained with the GRIPS 8 at an exposure time of 15 seconds during the night from February 5th, 2011 to February 6th, 2011 at the Environmental Research Station “Schneefernerhaus”. During routine observations one spectrum is obtained every 15 seconds. Thus, the amount of spectra obtained each night ranges between 1800 (summer) and 3600 (winter) for our observation sites in Germany and up to 5000 spectra during winter conditions at ALOMAR (69.28°N/16.01°E) in Norway. Figure 4: Simultaneous measurements performed with the GRIPS 6 instrument at Oberpfaffenhofen (red) and with the GRIPS 7 at the Schneefernerhaus (blue), both in Southern Germany. The field of views in the mesopause region are approximately 200 km apart. Figure 4 shows the nocturnal evolution of OH* rotational temperatures and intensities for the night from June 27th to 28th, 2010, recorded simultaneously at two sites in Southern Germany. Both instruments witness rather strong oscillations in both airglow intensity and rotational temperature. 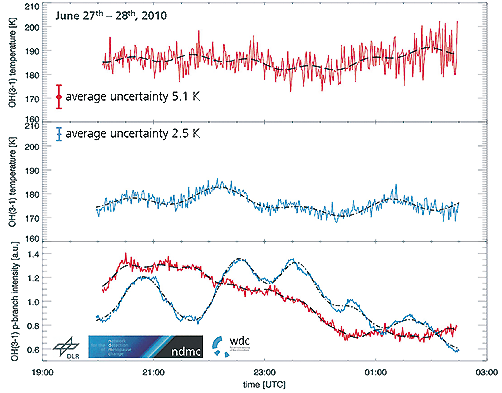 It is important to note, that intensities and temperatures constitute independent parameters in airglow observations (temperatures depend on relative line intensities, not on absolute intensities). Therefore, oscillations in temperature and intensities are usually not in phase. 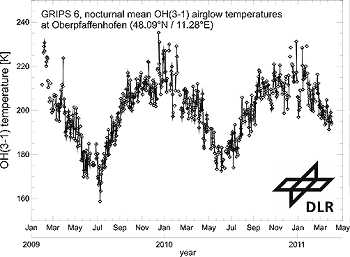 Figure 5: Course of nocturnal mean OH-airglow temperatures since the beginning of measurements at Oberpfaffenhofen at January 29th, 2009. For 629 nights (80% of the complete observation time) a nocturnal mean value was successfully retrieved, only a minor fraction is lost due to bad weather. As a consequence of the high temporal resolution a large number of spectra contribute to the nocturnal means resulting in a statistical uncertainty, which is less than 1 K for every value shown here. Note, that the upper atmospheric residual circulation causes low temperatures during summer and high temperatures during winter. The strong day to day variation is mainly caused by so-called planetary waves. The upper panels show the evolution of one minute mean values of rotational temperatures, the lower panel shows the respective airglow intensity variation at both sites. The black curves denote the dominant oscillations, which are retrieved applying a spectral analysis (harmonic analysis) to the data. During this night the wave activity differs significantly at both stations. A 2.2 hour (gravity) wave, which is clearly seen in the intensity variations at the Schneefernerhaus (lower panel, blue), can also be found in the data from Oberpfaffenhofen (lower, panel red), but its amplitudes are decreased by more than 60 percent. Finally figure 5 shows the evolution of nocturnal mean values since the start of observations in Oberpfaffenhofen on January 29th, 2009 to April 4th, 2011. The outstanding performance of the instrument resulted in the successful retrieval of nocturnal mean temperatures for 80% of all nights – a unique value for a midlatitude observation site. This excellent temporal coverage is owed to the fact, that the initial high temporal resolution allows to take advantage of small gaps in cloud coverage in order to collect enough data (at least two hours) for a representative nightly mean even during nights with rather poor viewing conditions. Bittner, M., K. Höppner, C. Pilger and C. Schmidt, Mesopause temperature perturbations caused by infrasonic waves as an early indicator for the detection of tsunamis and other geo-hazards. Natural Hazards and Earth System Sciences 10, 1431-1442, 2010. Leinert, Ch., Bowyer, S., Haikala, L.K., Hanner, M.S., Hauser, M.G., Levasseur-Regourd, A.-Ch., Mann, I., Mattila, K., Reach, W.T., Schlosser, Staude, H.J., Toiler, G.N., Weiland, J.L., Weinberg, J.L. and Witt, A.N. : The 1997 reference of diffuse night sky brightness. Astronomy & Astrophysics Supplement Series 127, 1-99, 1998. Meinel, A.B., 1950, OH Emission Bands in the Spectrum of the Night Sky. Astrophysical Journal 111, 555-564. Pilger, C. and M. Bittner, 2009, Infrasound from tropospheric sources: Impact on mesopause temperature? Journal of Atmospheric and Solar-Terrestrial Physics 71, 816-822, 2009.